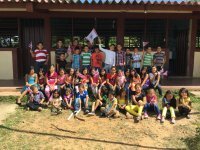 This school is in the neighbouring village of La Sabaneta and was also visited on the same day as the Escuela Lempira when they were having their annual Christmas meal sponsored by CH Trust. ‘Hello, my name is Alejandrina Cuellos and I am the Headteacher of the Francisco Morazan School here in La Sabaneta. Thank you Friends from England for all the help that you have given to us. 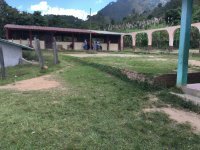 May God bless you greatly so that you can continue helping the poor families here in the village of La Sabaneta who have benefitted greatly from your help to date. Previously the School did not have proper furniture like we do now. Thanks to you the children now sit very comfortably in the classroom on good quality chairs and have good quality tables as well. Also, the families are very pleased about the presents that the organisation sends to the children. Only very few children continue with their studies once they have finished sixth grade partly because the next school is a long way away and also because they may be needed to help their families in terms of agriculture or looking after livestock. The mothers are housewives and occupy themselves with making tortillas or looking after the home. The fathers are employed cutting sugar cane between December and May and for the rest of the year they grow maize and beans for their own consumption. Well, we are very grateful to all the families from England who give one grain of sand and say that this for La Sabaneta. You cannot imagine how beneficial your help has been for this School in terms of educational materials and also the provision of food such as milk, oats, pasta, sauces and all that sort of thing. 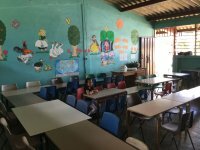 As a result the children have a more balanced and tasty diet rather than just the rice and beans which are mandated by the Honduran Government. Many many thanks. Please remember La Sabaneta if more projects are in the pipeline. You have no idea how grateful the families here would be. May you have a prosperous 2015 and may God bless you greatly. ‘Thank you for this lunch which those from England have given us. Thank you for giving us this School, thank you for the desks. Thank you for everything and thank you for the lunch’.